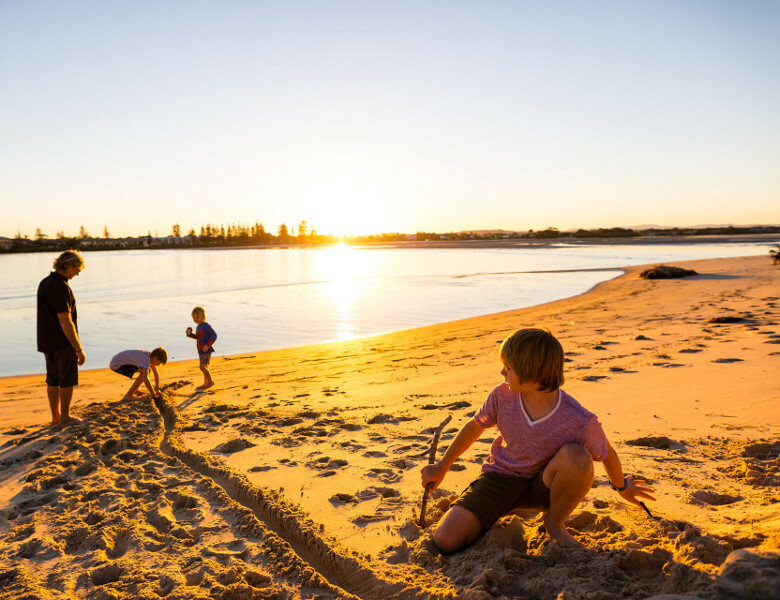 Ballina Shire has plenty of sheltered, quiet and calm inlets which are ideal for families and fishing. Lake Ainsworth - Pacific Parade, Lennox Head - CURRENTLY CLOSED - Contact 1800 777 666 for information and updates. Fresh water tea tree stained lake. Ideal for swimming, kayaking and stand up paddleboards. BBQ facilities and shade. Heading north over Missingham Bridge, this is the sandy beach fronting on to North Creek that you see on your left hand side. Calm waters - this is a popular spot for families with younger children. Heading north over Missingham Bridge, this is the sandy beach you see on your right hand side. Smaller waves depending on the swell - great for learn to surf and snorkelling. Popular spot for all ages as lots of shade on the grassy hill. This is an off leash dog friendly beach that fronts directly on to the Richmond River. The northern end has more waves and the southern end is flat and calm with large shallow sections, great for little ones. Man made pool, thigh deep making it great for younger children. Lots of smaller rockpools for children (and adults) to explore.